Cover Description: Superman hovers before a field of monitors, each containing an individuals all pointing or grimacing towards him. Heroes pictured in the monitors include Blue Beetle II, Booster Gold, Captain Atom, and Elongated Man. Brief Synopsis: Superman considers abandoning his secret identity to spend more time helping the world. 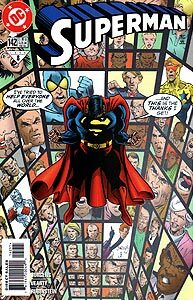 Issue Notes: Superman diamond chronology "1999:8." PRODUCT PLACEMENT: For a televised WGBS report, Booster Gold recalls Superman's heroic actions saving a pair of trains in Fargo, North Dakota. 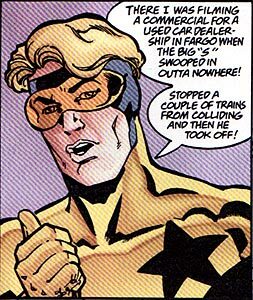 While Superman was saving a railroad, Booster was filming a television advertisement for a used-car dealership. Some things never change. This is Booster's only appearance in this issue. Boosterrific Review: For quite some time, all issues of DC's Superman titles have been episodic installments in a larger ongoing storyline. While this particular issue fails present any major events or even to tell an entire story, it does include several dramatic moments of action while serviceably advancing the plot of the current "Emperor Superman" storyline. Therefore, it is about what can be expected from contemporary Superman titles.